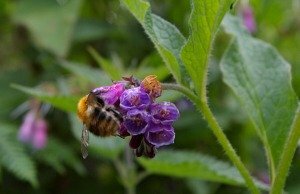 There's a great variety of wild and cultivated herbs for bees out there, and many herbs are among the best plants for bees. Of course, they also attract many other pollinators, from butterflies to hoverflies. Many herbs are easy to grow from seed, and an excellent choice of seed is widely available, with some suppliers offering a range of organic, non-gmo varieties in small packets, such as this one, which offers a superb range, including bee-friendly herbs! Some herbs can also be grown from cuttings, or plants can be divided and shared with neighbours. If you have herb plants that could be shared in this way, why not give them to your friends and neighbours, or donate them to a local school garden or community project? As well as being beneficial for bee and other pollinators, they also help to make our meals tastier, provide fragrance, flower and texture in the garden, and are believed to have health-giving properties. Feed yourself and feed the bees! A fragrant, excellent cullinary herb loved by all kinds of bees (bumble bees, honey bees and a range of solitary bees,) as well as other pollinators. Pretty pink flowers available in a range of shades. Dwarf varieties are available, and you can freeze or dry the leaves to enjoy them in your cooking later. I have read that borage refills with nectar every 2 minutes! This is exceptionally fast. No wonder all kinds of bees love it! The pretty blue flowers can be added to salads, or into ice cubes to include in drinks. Borage is easy to grow from seed, and in my experience, it grows quite tall. It can look a little 'gangly', so I think it's best if it occupies a space at the back of the border. 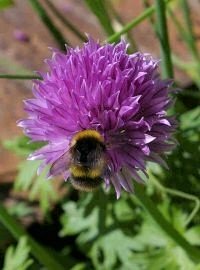 For chives to be beneficial to bees, you obviously have to allow them to flower. You can still clip some of the stalks for cooking. Chives in flower. The flowers are attractive and bees love them. Again, I have found chives easy to grow from seed. I start them off in small pots, and any spare can be given away. Planting them out in the garden is very rewarding. They begin quite spindly with just a few stems, but soon fill out in the following year. As stated, the non-flowering 'stems' can still be used in cooking, and can be clipped whilst the plant is in flower. I love the purple 'pom-pom' head of chives, and actually have it in my rockery. 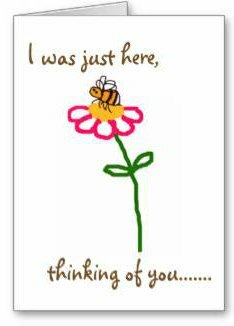 Bumblebees visit the flowers every year. Choose different varieties for a prolonged season. You can propogate more plants from cuttings, but ensure you take quite a few as they may not all 'take'. Remember you can also collect the fragrant seeds for potpourri, and I know some people add them to home made toiletries. Bombus pratorum male (Early-nesting bumblebee) on lavender. Another excellent flower for bees – refills with nectar approximately every 45 minutes. All kinds of bumblebees and solitary bees feed on it, as well as honey bees. Some shorter tongued bees may engage in nectar robbing to access the nectaries, as pictured right. 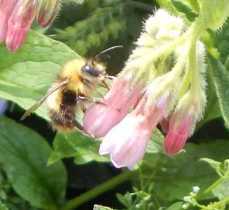 I have a number of short films and a further page about bees nectar robbing comfrey here. The sage family of plants are wonderful for bees and other pollinators. Thyme can also be used to create a small patch of lawn. The fragrance and appearance is beautiful. Butterflies like thymes too. Having pale, lilac, blue, white or pink delicate tubular flowers, this is a lovely old fashioned herb which is easy to grow. It can be used as a companion plant to help attract bees, and is useful in pots and containers. Bees love the flowers, but I have also read that some beekeepers apply mint oil diluted with water to their beehives to deter wax moth. I was once asked by a gentleman whether it would be possible to deter the dreaded wax moth from invading a bumble bee nest he had discovered in his compost heap. He was very fond of bumble bees and keen to help them out. I told him he could try placing a pot or container of mint close to the entrance of the nest (best to do this at night). I explained that I have no idea whether or not it definitely would work, although there is a theory that it helps to protect honey bees. Was the experiment successful? Alas, I have no idea, since I have had no opportunity to try it for myself. Mint can spread and take over a bit, so it may be best to confine it to a pot or container. Sow a culinary parsley, such as flat leaf, and allow it to flower. Bees and other pollinators such as butterflies and hoverflies will thank you for it! Parsley can grow quite tall, but I honestly think it is a lovely herb which adds wonderful texture and "calm" to a flower border. Dill is one of the herbs I use most often in cooking. It has a gorgeous, delicate flavour I find very versatile in the kitchen. When allowed to flower, it is also especially enjoyed by honey bees and butterflies (such as swallowtails if you have them in your country). I think dill adds a graceful softness to a border. Whilst I prefer to use everything from fresh when I can, like many herbs, dill can be frozen. Simply cut off several stems, wrap in foil and freeze immediately. I add the stems to dishes whilst they are still frozen, and I find the flavour comes out beautifully during the cooking. Excellent early food source for bees. It is often considered easy to grown, but where I live, I have found it difficult to get small plants established. I think young plants need a lot of TLC and shelter from very cold conditions. It is reputedly helpful in repelling 'pest' invertebrates, despite the fact that bees enjoy foraging on it. Also popular with seed-eating birds and hoverflies, as well as bees. Find out how to grow Fennel here. 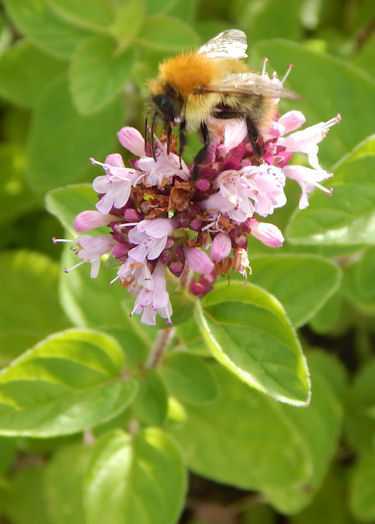 Pretty herb loved by a variety of bees and hoverflies. Often referred to as 'bee balm'. Long tongued bees especially, enjoy this pretty herb. 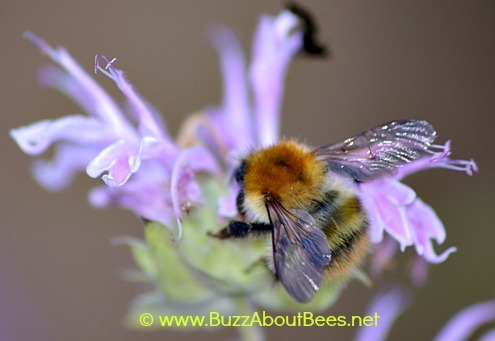 There are also cultivated varieties of Monarda available, which are also enjoyed by bees. Small, pink flowers loved by bees, with the plant itself slightly resembling the nettle. I have hedge woundwort in our border, but I should warn you its root system spreads very quickly, and the fragrance is not very pleasant, but the bees do love it. It also spreads freely through seed dispersal. Another great bee and butterfly plant. Gorgeous shrub loved by bees and other insects. A sprig of Myrtle was traditionally carried in the bridal bouquets at British royal weddings, from Queen Victoria to Kate Middleton. The Myrtle is allegedly even grown in Queen Victoria's garden. Well, if it's good enough for Queen bees, I suppose it's good enough for the human royals too!! 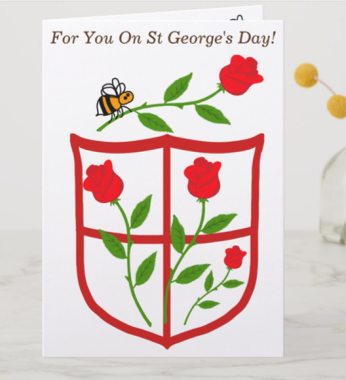 Adored by bumble bees, honey bees and solitary bees. Note, cats love it too, so if you have an allergy to cats, it would be best to avoid it, as you may attract them!. A pot of herbs makes a lovely gift and can be prepared easily at home. Home-made gifts such as these are increasingly appreciated - and not only by gardeners. This is a great way to help bees and give an environmentally friendly gift to a neighbour. If supplied as seed, they can be wrapped up in a pretty pot with the seeds inside, tucked easily into an envelope, or presented with a set of handy gardening tools, gloves or clogs. ....Herbs are always in fashion in gardens. You may or may not have space for a large kitchen herb garden, but most people can squeeze in a few herbs at least somewhere, even if they only have a yard, balcony, hanging basket or doorstep for pots. You could create a container herb garden, or a window herb garden. Of course, herbs not only help pollinators, they have many uses for humans too: cooking, medicinal uses, fragrance, not to mention their beauty and verstility in the garden. 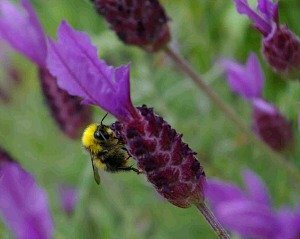 If you are purchasing ready grown herb plants rather than growing from seed, please try to purchase from an organic supplier to ensure they have not been cultivated with the use of an insecticide that is toxic for bees - particularly a neonicotinoid. Take a look at these different lists of plants for bees. including wildflowers, garden plants, trees, shrubs and even fruit and vegetables! Some great handy tips for creating a garden to attract bees. It needn't cost a fortune to create a bee garden! Take a look at these ideas for getting free (or nearly free) garden plants! What makes bees such excellent pollinators, and how important are they? Here are 10 simple things you can do to help the bees. Why not share these tips with your friends?